Mold & Bacteria Consulting Laboratories provided a professional development course (PDC) at the AIHce 2010, in Denver, Colorado. Details of that course are below. Description: The PDC will enable participants to recognize indoor mold, develop effective sampling strategies and interpret laboratory results, all in the context of current mold-control and remediation principles. Participants will acquire a detailed understanding of the methods used to investigate mold growth in buildings and types of samples to collect. Discussions will explore the biology of molds, the causes of mold growth, as well as mold control and common indoor molds. Environmental professionals, city building inspectors, and other professionals seeking training in Mold Recognition, Effective Sampling Strategies and Results Interpretation can attend a one-day mold training course offered in Burnaby, British Columbia; Mississauga, Ontario and Saskatoon, Saskatchewan. Sponsored by Mold & Bacteria Consulting Laboratories (MBL) Inc., the course provides participants with skills and background information to enable them Recognize Indoor Mould, Develop Effective Sampling Strategies, and Interpret Laboratory Results. 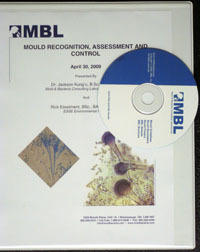 The MBL Mold Training Course provides insight into the causes of mold growth and control, the most important indoor molds, including important species of Penicillium, Aspergillus, Fusarium, Trichoderma, Cladosporium, Mucor, Rhizopus, Alternaria and Scopulariopsis and also mycotoxins that may occur in an indoor environment. Participants can develop a detailed understanding of the methods used to investigate mold growth in buildings, types of samples to collect as well as how to interpret laboratory results. The mold course provides a basic understanding of the biology of molds. If you have been considering attending a similar course, don’t delay in registering as we have limited spaces! Click Booking Calendar to book for the course. The primary objective of the mold training course is to provide course participants with skills and background information to enable them Recognize Indoor Mold, Design Effective Sampling Strategies, Interpret Laboratory Results and Understand the Current Mold Guidelines. The MBL Mold Training Course provides insight into the causes of mould growth and control, the most important indoor moulds, including important species of Penicillium, Aspergillus, Fusarium, Trichoderma, Cladosporium, Mucor, Rhizopus, Alternaria and Scopulariopsis and also mycotoxins that may occur in an indoor environment. Participants will learn in detail the methods used to investigate mould growth in buildings, types of samples as well as how to interpret laboratory results. The mold course provides a basic understanding of the biology of moulds. Toxic substances produced by fungi. Mucor sp. is often found in soil, dead plant material, horse dung, fruits and fruit juice. It is also found in leather, meat, dairy products, animal hair and jute. Mucor sp. may be allergenic (skin and bronchial tests) and may also cause mucorosis in immune compromised individuals. The sites of infection are the lung, nasal sinus, brain, eye and skin. Infection may have multiple sites. Trichoderma sp. is commonly found in soil, dead trees, pine needles, paper, unglazed ceramics. It readily degrades cellulose and often will grow on other fungi. It produces antibiotics which are toxic to humans. Trichoderma sp. is reportedly allergenic. Scopulariopsis sp. may produce arsine gas if growing on arsenic substrate. This can occur on wallpapers covered with paris green. It has been found growing on a wide variety of materials including house dust. Scopulariopsis sp. is associated with type III allergy. Rhizopus sp. is reportedly allergenic. It may cause mucorosis in immune compromised individuals. It is often linked to occupational allergy. May cause mucorosis in immune compromised individuals . The sites of infection are the lung, nasal sinus, brain, eye and skin. A large number of organisms have have been placed in this genus. Identification to species is difficult. Often found in aerosol samples. Penicillium is commonly found in soil, food, cellulose and grains. It is also found in paint and compost piles. It may cause hypersensitivity pneumonitis, allergic alveolitis in susceptible individuals. It is reported to be allergenic. It is commonly found in carpet, wall paper, and in interior fiberglass duct insulation. Some species can produce mycotoxins. Common cause of extrinsic asthma (immediate-type hypersensitivity: type I). Acute symptoms include edema and bronchiospasms, chronic cases may develop pulmonary emphysema. Alternaria is a very common allergen. It is often found in carpets, textiles, and on horizontal surfaces in building interiors. Often found on window frames. Outdoors it may be isolated from samples of soil, seeds and plants. It is commonly found in outdoor samples. It may be related to baker’s asthma. It has been associated with hypersensitivity pneumonitis. The species Alternaria alternata, is capable of producing tenuazonic acid and other toxic metabolites which may be associated with disease in humans or animals. Common cause of extrinsic asthma (immeadiate-type hypersensitivity: type I). Acute symptoms include edema and bronchiospasms, chronic cases may develop pulmonary emphysema. Aspergillus spp are reported to be allergenic. Members of this genus are reported to cause ear infections (see Aspergillus niger) . Many species produce mycotoxins (see Aspergillus flavus) which may be associated with disease in humans and other animals . Toxin production is dependent on the species or a strain within a species and on the food source for the fungus. Some of these toxins have been found to be carcinogenic in animal species. Several toxins are considered potential human carcinogens. Common cause of extrinsic asthma (immediate-type hypersensitivity: type I). Cladosporium spp are commonly found outdoors. The outdoor numbers are reduced in the winter. The numbers are often high in the summer. Often found indoors in numbers less than outdoor numbers. It is a common allergen. Indoor Cladosporium sp. may be different than the species identified outdoors. It is commonly found on the surface of fiber-glass duct liner in the interior of supply ducts and on cold, condensing surfaces. A wide variety of plants are food sources for this fungus. It is found on dead plants, woody plants, food, straw, soil, paint and textiles. It’s allergenic. Fusarium sp. are found on a wide range of plants and in humidifiers. Several species in this genus can produce potent trichothecene toxins. Some species also produce vomitoxin on grains during unusually damp growing conditions. Poisoning by these toxins occur primarily through ingestion of contaminated grains or possibly inhalation of spores. The genus can produce hemorrhagic syndrome in humans (alimentary toxic aleukia). This is characterized by nausea, vomiting, diarrhoea, dermatitis, and extensive internal bleeding. Fusarium is reportedly allergenic and some species are frequently involved in eye, skin and nail infections.